Three down, one to go after the Leafs inked Auston Matthews to a 5 year deal, worth $58.17 million, with an annual salary cap hit of $11.634 million beginning in 2019-20 and running through the 2023-24 campaign. Of course, this being Leafland, any joy that Matthews is signed will quickly dissipate, as the gnashing of teeth begins on the Marner contract. THIS is a trend setting contract. Not so much in the dollars (which are entirely reasonable for Matthews – both in terms of what he is today as a player and what he is likely to become). The structure and term is likely to be the new normal, given the multiplicity of highly talented RFAs coming out in the league these days. And it’s also what teams and players need to do to manage the cap. Forget about locking up the player for 8 years, do 5 and let them go UFA at 26. It’s the only way these things work under a hard salary cap. This creates liquidity among star players who can switch teams with enough time to still be difference makers. It also gives teams flexibility because they neither have to predict what the player will be like in 5 years, nor worry about being unduly penalized by continuing to be successful in drafting and developing new players, only to lose them too quickly. No doubt the subsequent Marner negotiations, whether they take place now or during the offseason, will be tough. If I’m Darren Ferris, and Kyle Dubas approached me with a view toward signing before the end of the season, I might respond, “Sure. Send me the Matthews contract, replace his name with ‘Mitchell Marner’, and you have a deal.” That of course, is unlikely to be accepted. Nor should it be. Yes, Marner is a tremendous talent, but wingers will never be valued as highly as either centres or D-men. Marner is just not someone you build around the way you do with Matthews, especially come playoff time. I’ll take the 6-3, 220 sniping center over the ballerina any day of the week. Marner’s terrific, don’t get me wrong, but he’s the 3rd most important forward on the Leafs. The bigger issue is down the line. How do you manage a team? The way you used to do it in the pre-salary cap era was to put a bunch of rugged vets on the 3rd and 4th lines, score with the first 2, punish and tilt the ice with the bottom 6 players. But you can’t afford that anymore. So you need to create depth through the system. Young, inexpensive players (discovered in the later rounds of the draft) must fill those slots now. The Leafs have to be careful and creative. But growing up as a Leafs’ fan during the Harold Ballard era, I’m more inclined to celebrate “problems” which feature an overabundance of talent (at least relative to the House of Horrors to which we fans were exposed during those dark years). It’s akin to the “problems” Bill Gates has when he’s calculating his tax liabilities. True, with the benefit of hindsight, I suppose we could all criticize Kyle Dubas for failing to focus immediately on the Matthews/Marner situations, the minute Tavares was signed. Hindsight is a 20/20 art and no doubt an offer of $9m a year (which was reportedly what Marner’s agent demanded last off-season), would have been greeted with huge criticism, and complicated the negotiations with Nylander. 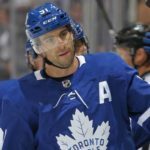 Perhaps the real mistake was not offering Matthews an extension immediately after Tavares was done to establish a firm pay pyramid. But Matthews is done and the AAV is not bad all things considered. At least it’s one less thing to worry about (at least for the next 5 years). And for all of the gnashing of teeth about Marner, that to me is not the real problem. Even if he is given an offer sheet, the Leafs will certainly match it. The real challenge for Dubas going forward, however, will be signing players like Kasperi Kapanen and/or Andreas Johnsson to reasonable deals. Let’s say either is given an offer sheet of say, $4m/yr for 5 years. If Toronto doesn’t match, they’ll receive a 2nd round pick as compensation. To me, that’s chicken feed compared to what either player is worth. I’d make offer sheets to both all day long if I know my loss is only a 2nd rounder. 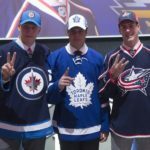 By contrast, for Marner, the cost will be considerably higher: four 1st round picks. So it’s hard to imagine too many teams willing to do that (although one or two might and Leafs will certainly match). 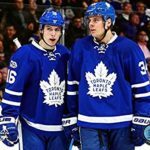 Does Dubas have to consider dealing one or both of Johnsson or Kapanen to maximise their respective value (especially if it means getting that elusive RH defenceman)? 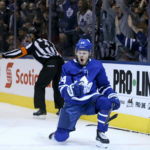 Alternatively, with the imminent return of Tyler Ennis (who has just started skating again with the Leafs), and the recent revelation that is Trevor Moore (also just recently re-upped for another 2 years at a cap-friendly AAV of $775,000/year), does this make Connor Brown expendable as a future salary cap casualty? It’s always sad to contemplate the loss of a likeable, talented, hard-working Toronto born and bred player like Brown, who loves playing for the Leafs. But those are the kinds of things we Leafs’ fans have to contemplate as Kyle Dubas continues to navigate his way through this challenging thicket of contract negotiations for Toronto. One final postscript: who will blink first when it comes to the next set of negotiations: Miko Rantanen or Mitch Marner? Because you know that their respective agents will be looking with great interest at their respective negotiations to establish a baseline comparable for their clients. Colorado has the smaller balance sheet, so no doubt Toronto will be hoping that the Avalanche move to establish a lower range first. Looking closer to home, no doubt Brayden Point’s contract negotiations with Tampa just got considerably more interesting today. Fascinating times ahead to be sure all around the league.